The winner of Lee's book is: Mariska. Congrats, Mariska! Send me your contact info and I'll pass it along to Lee. Thanks to everyone who participated. Lynda’s guest blogger Tracey Morris gave you a brief intro into some of the supernatural happenings in the Ozarks when she talked about the Crescent Hotel in Eureka Springs. Been there, done that – it’s a gorgeous old place and I highly recommend it to anyone who can get there; the atmosphere is superb for any lover of the paranormal. The town itself is pretty interesting, too – including the church that you enter on one level and exit on another (did I mention that the streets are very steep?). My novels are set in the Ozarks too, but in the fictional counties of Blackburn and Fulbright, where “things happen” – everything from Civil War ghosts to the wanderings of sad souls still trapped on the Trail of Tears. There are plenty of real Ozarks locations in my stories, too, like Mammoth Spring and the wonderful Blanchard Springs Caverns at Mountain View. But having fictional counties to set my tales in has worked well because sometimes my characters need a location that’s just not situated properly for the action in the real Ozarks. They can always step outside their fictional homes, though, and visit the real thing when it’s called for. 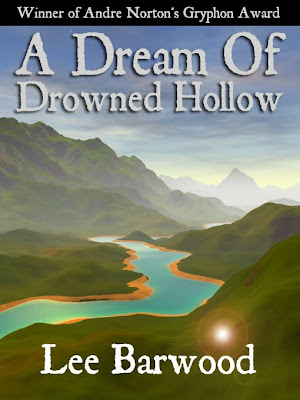 My novel A Dream of Drowned Hollow is a paranormal environmental thriller that draws pretty heavily on the lore and legends that saturate the region. April Rue Stoner, my heroine, belongs to a family that has special talents – each family member can do something unusual, whether it’s a gift of healing or of music or of seeing the future. April Rue’s particular gift involves seeing spirits, but not just that – she can capture what she sees in photographs, so that others can see them too. That turns out to be her only weapon against a ruthless developer determined to bring his own version of prosperity to the place where he grew up. His goons have resorted to sabotage and even murder to force people to sell out to him, and April Rue’s photographs are the only proof of what he’s doing. It’s a race against time as she tries to expose him for what he is. Her grandmother has already died because of what he’s done. Will she be able to stop him, or will he get to her first? There really are Ozark families with special gifts – such as dowsers, also known as water witches. When we first moved there one of our neighbors came out and witched us a well. The beautiful thing about the Ozarks is the daily, vital presence of beliefs that many other regions of the country have left behind. It has a rich history of folklore and old customs that haven’t vanished yet – old beliefs are still in practice, such as predicting the winter based on the shape of the seeds inside a persimmon: knife-shaped for knifelike cold, spoon to tell you you’ll need a shovel for all the snow, fork for mild. People still get together to play music, and still gather for community potluck suppers – things city folks would be very surprised at – and the presence of ghost lights at Durdon and Crossett are still reported, variously supposed to be the ghost of a railroad man killed by a train or the lights of UFOs. In Dyer, if you put your car in neutral on one side of the bridge, something will pull the car to the other side. And at Rogers, the former site of a Civil War encampment, visitors after dark will hear the sounds of marching troops, musket fire, and galloping horses. One of the sad things about city living is that people tend to forget that there are such gifts, or pooh-pooh them and the beliefs that grew up around them. But in the country, where there are fewer distractions, a lot of things survive because there aren’t a lot of naysayers telling everyone that something’s impossible. And people know what they’ve seen. They may not have an explanation for it, but that’s the nature of the paranormal, isn’t it? Lee will give away a copy of her book to one commenter. Her winner will be selected and posted on Tuesday night. Stop back by to see if you won! Wow! Your book sounds wonderful. I love the Ozarks (my mom was born not too far away in the town of Malden, MO) and I remember driving through the hills on our many trips to see family in the area. Hauntingly beautiful (if you'll pardon the pun). Now I want to stop and do I little ghost watching at the confederate site.